Belching is a common but usually socially unacceptable fact of life. It may happen a dozen times throughout the day, and many have rotten egg burps as a result. This form of expelled gas from the stomach may have a pungent odor depending on the foods consumed or medications ingested. Knowing how these sulfur burps occur may lead to a more successful way of treating and possibly preventing them. What Are Sulfur Burps or Rotten Egg Burps? If you frequently say to yourself, “When I burp it smells like rotten eggs,” you may be suffering from sulfur burps. A burp occurs when gas or air escapes from the stomach through the mouth. Belching is another term for this. Most burps have no smell or odor, but sometimes you may produce a rotten egg or sulfur smell. This type of burp is produced by a digestive gas called hydrogen sulfide, resulting from microbes in the small intestine or by the breakdown of certain foods in the stomach. Sulfur is an essential mineral for healthy connective tissue and prevents toxins such as harmful bacteria from damaging the cells. In addition to food and carbonated beverages, burps that smell like eggs may be caused by certain medications and some health conditions. Most of the sulfur within your body comes from the food you eat. Sulfur-containing proteins are transformed into essential amino acids for enzyme production and growth, as well as tissue preservation. Sulfur foods include preservatives used in meals at restaurants and packaged goods such as guacamole. Eggs, red meat, poultry, fish, and dairy products contain sulfur. It is also found in vegetables such as cabbage, onions, asparagus, and sweet potatoes. Legumes like peas, beans, lentils, and alfalfa may also cause you to produce gas, as well as fruits like bananas, avocado, and watermelon. Rotten egg burps may also occur after consuming grains and nuts, and beverages such as coffee, tea, and soda. The way you consume the foods you eat can also have a huge impact on whether burps smell like rotten eggs or not. In addition to the type of food you eat, such as sugar-laden or high-fat foods, the amount ingested can also play a role. Eating a large meal forces the digestive tract to slow down and take longer to break down the food. The hydrogen sulfide in food can collect and remain in the abdomen before being expelled as burps. Prescription medication is another reason that burps smell like rotten eggs. A combination of ingredients with cysteine or methionine amino acids may produce sulfur burps. These occur with medications that dissolve on their own within the digestive system. It is best to discuss any drug that is causing the strange-smelling burps with your health team before stopping the medication. Also known as giardiasis, a Giardia infection of the intestines may result in your having sulfur-smelling burps. Caused by the Giardia lamblia parasite, this type of infection is seen in areas with contaminated water. It is also contracted by direct contact with an infected person and consuming contaminated food. Signs of a giardia infection may include diarrhea, severe stomach cramping, nausea, and bloating. The infection itself may last for several days. This condition is characterized by egg-smelling burps, nausea, bloating, heartburn, and vomiting. It involves a slow emptying of the digestive tract within the stomach, which allows bacteria to develop. Food may also obstruct the digestive tract if it does not properly break down. Gastroparesis may occur due to medications or health conditions that damage the nerves or abdominal muscles such as gastric surgery. IBS irritates the large intestine, also known as the colon. This disorder causes bloating, constipation, diarrhea, abdominal pain and gas. Sulfur burps are a common symptom. 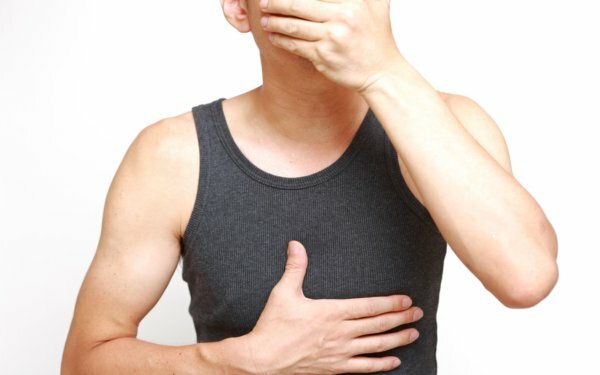 Commonly referred to as GERD, the condition causes rotten egg burps with heartburn, chest pain, or pressure on the chest. GERD occurs when the lower esophageal sphincter between the esophagus and the stomach fails to close properly. This causes food or stomach acid to return to the esophagus. If your breath smells like sulfur, the cause may be a condition known as small intestinal bacterial overgrowth or SIBO. It occurs due to the overproduction of bacteria within the small intestine caused by digestive issues such as lactose intolerance, fructose malabsorption, celiac disease, and Crohn’s disease. Other signs and symptoms include bloating, cramping, diarrhea, and flatulence. Sulfur burps may also be caused by a gallbladder disorder or disease, an empty colon, extreme stress, and anxiety. If you want to know how to get rid of egg burps, there are several lifestyle changes you can follow. Use baking soda as an antacid for a natural way to get rid of sulfur burps. However, those with high blood pressure should avoid using this remedy. Mix one teaspoon of baking soda in one cup of water and heat on low for five minutes. Stir and drink the solution. For quick relief, mix one-half teaspoon of baking soda in a glass of water and drink. Apple cider vinegar helps to balance the pH levels to reduce rotten egg burps. It may also help treat abdominal problems within the digestive tract. Combine two teaspoons of apple cider vinegar and one cup of water in a glass. Be sure to drink it 20 minutes before each meal. For instant relief, mix apple cider vinegar with warm water. The gel of the aloe vera plant contains anti-inflammatory properties to help with digestive issues and abdominal tension. Excessive use may cause loose bowels due to its laxative properties. Remove the gel from one leaf of an aloe vera plant and place it in a small bowl. Blend two tablespoons of the gel with a bit of water to a juice-like consistency, for approximately two to three minutes. Drink one glass 20 minutes before a meal, twice a day. Lemon or ginger may be added for flavor, or dilute it with fruit juice. Licorice root may reduce or prevent burps as it protects the stomach lining by soothing active mucous membranes. Boil one teaspoon of licorice root powder with one cup of water. Strain and drink one cup of the tea at least 20 minutes before each meal twice each day. Use the digestive benefits of fennel leaves or seeds to ease abdominal muscle spasms and reduce sulfur burps. Boil one teaspoon of fennel leaves in one cup of water. Steep for five minutes and strain. Drink three times each day. You can also use fennel seeds for belching issues by chewing a handful at the first sign of burps. Both lemon and honey have anti-inflammatory and antioxidant components to help slow harmful bacteria growth. Combine the juice of a fresh lemon and one teaspoon of honey and drink the solution. Repeat daily. Green tea has antioxidants to help flush out toxins from the body. So, drinking it may help reduce or prevent egg-smelling burps. Boil one teaspoon of dried green tea powder or one green tea bag in water for five minutes. Strain and drink two cups daily. The properties of peppermint help to reduce gas formation and indigestion issues that cause distasteful burps. Boil peppermint leaves in a pot of water for five minutes. Remove from heat and strain the solution. Be sure to drink up to three cups each day. Rotten egg burps are embarrassing and can literally leave a bad taste in the mouth. While we need sulfur for proper nourishment and functioning, too much of it from our food and medication may cause an excess of foul-tasting burps. However, an underlying health condition may also be to blame. Sulfur burps may be common but do not need to be a way of life. By knowing the foods, medications, and beverages that can cause these types of burps, as well as how we consume them, we may be able to alleviate them with simple home treatments. So, if you experience rotten egg burps on a regular basis, preventing them can also become a conscious priority. “Gas,” MedlinePlus, May 11, 2017; https://medlineplus.gov/gas.html, last accessed September 15, 2017. Jyoti Sen, D., “Obnoxious gas causes burping is due to unnatural food habit,” World Journal of Pharmaceutical Sciences, March 2015; 3(3): 565-569; http://www.wjpsonline.org/view_issue.php?title=Obnoxious-gas-causes-burping-is-due-to-unnatural-food-habit, last accessed September 15, 2017. Huckabee, M., “What’s in a Burp?”, University of Nebraska Medical Center, December 17, 2013; http://app1.unmc.edu/PublicAffairs/TodaySite/sitefiles/today_full.cfm?match=12090, last accessed September 15, 2017.